2001 Night Club is so well known that it hardly needs an introduction. Located at 920 Lake Arrowhead Road in Myrtle Beach, South Carolina, this all-night club has ferociously loyal patrons, and displays the wildest dancing on the Beach. Myrtle Beach offers great diversity in its many samples of nightlife, and sometimes there is enough diversity in one location alone to satisfy the most energetic partygoer. Celebrations offers four different night spots in one location. For the best in entertainment and side splitting laughs, Comedy Cabana in Myrtle Beach is the only five-star comedy club on the Grand Strand that offers three new professional comedians each week. This unique and fun establishment is divided into two rooms. If you are in Myrtle Beach, chances are you are touring around the town looking for a good time. 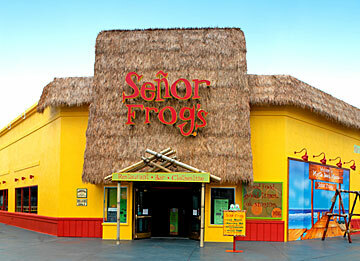 When the night falls, Senor Frogs has just what you need. The place creates a laidback environment that inspires you to eat, drink, dance and just let loose and be yourself. Tunnel Ultra Lounge in Myrtle Beach, South Carolina can be summed up in one word: sumptuous. This establishment has pulled out all of the stops to become the place to go when the night comes. Located at 1901 King’s Highway on the Grand Strand, the Tunnel Ultra Lounge is easy to find and hard to leave. 2001 Night Club is so well known that it hardly needs an introduction.